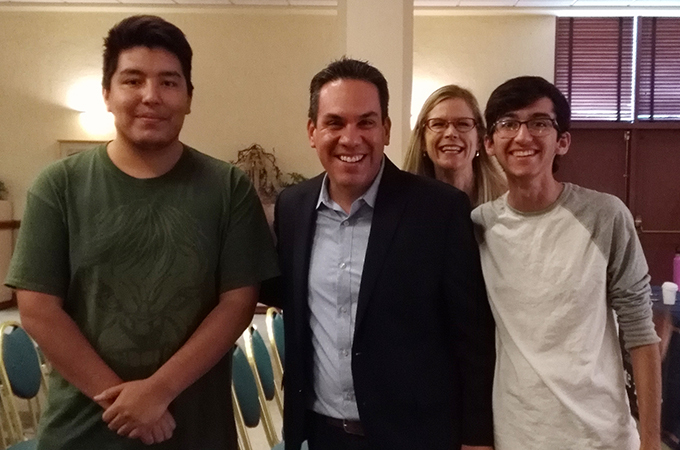 Representative Pete Aguilar '01 (center) stands with Santiago Rodriguez ’21 (left) and Aiden Bazzal ’20 (right), with Political Science Professor Renée Van Vechten in the back. In anticipation of the upcoming midterm elections, Representative Pete Aguilar ’01 visited the University of Redlands last week to hold a student-focused town hall meeting. Students crowded into the Casa Loma room, many sitting on the floor, for the chance to discuss topical issues with Aguilar. Political science Professor Renée Van Vechten opened the event by introducing Aguilar and welcoming him back to the University. Aguilar then introduced himself and recounted how he’d arrived at his position in public office. As an undergraduate student at the University of Redlands, Aguilar worked for a trustee of the University through the Tinker Scholarship and interned for California Governor Gray Davis. He later ran for City Council, became mayor of Redlands, and eventually won the election for California’s 31st Congressional District. As the representative of the 31st District, Pete Aguilar is a public servant for one of the most diverse counties in the United States. Aguilar’s voting record in Congress has reflected the various interests of the constituency he serves. Since being elected in 2015, Aguilar has focused on expanding protections for immigrants offered under Deferred Action for Childhood Arrivals (DACA), increasing protections for LGBT+ workers, providing job assistance to veterans, curbing gun violence, and increasing funding to combat the opioid epidemic. Students posed questions to Aguilar on what he has done to aid communities and his perspective on issues such as gun control, the local mental health crisis, and the use of property tax to fund school districts. When asked if he was considering running for any other office, Aguilar answered in the affirmative and pledged to continue focusing on economic justice for the lower and middle class, lowering student debt, and instituting better programs for senior citizens and veterans. Aguilar’s closing statements focused on rallying students to participate in government, whether it be campaigning, holding forums, registering others, or simply getting out to vote. The primary purpose of a representative holding a town hall meeting is to enable officials to directly engage with the electorate and immediately hear about issues concerning the people. While the student-focused town hall served the essential purpose of a town hall, we felt Aguilar ultimately missed the mark in rallying students to participate in politics; the majority of student activism occurs at the grassroots level, and the conversation regarding student participation focused on larger bodies of government rather than detailing options for community action. While Aguilar mentioned the average donation to his campaign is $16 and encouraged people to get out and vote, the message regarding a student’s ability to impact politics was essentially underwhelming. Speaking as college students, being able to meet a congressperson and ask about issues that matter to us was a privilege. At the same time, the experience failed to strengthen our feeling of connection to the political process. The town hall meeting was hosted by the Political Science Department, which will also be hosting an appearance by Aguilar's opponent in the midterms, Sean Flynn. Learn more about studying political science at the U of R.